Strange, stylish and unnerving, 'The Hole In The Ground' is a fine example of well-made horror. Trying to escape her broken past, Sarah O'Neill (Séana Kerslake) is building a new life on the fringes of a backwood rural town with her young son Chris (James Quinn Markey). A terrifying encounter with a mysterious neighbour shatters her fragile security, throwing Sarah into a spiralling nightmare of paranoia and mistrust, as she tries to uncover if the disturbing changes in her little boy are connected to an ominous sinkhole buried deep in the forest that borders their home. 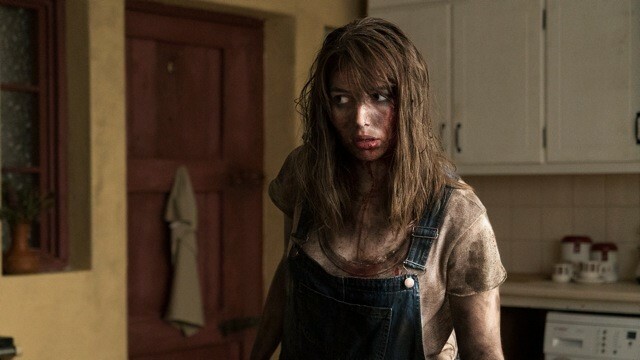 Calling 'The Hole In The Ground' the best Irish horror in years isn't much of a compliment, primarily because the field of Irish horror is decidedly underserved. Efforts in recent years like David Freyne's 'The Cured' have done well, but there's been very few Irish horrors that manage to break through and reach a wider audience beyond our shores. 'The Hole In The Ground' might be that effort, if for no other reason that you'd be forgiven for thinking it was Irish in the first place. Sure, the idea of changelings is one that's buried deep (no pun intended) in our national folklore, but 'The Hole In The Ground' plays it more like a version of Jennifer Kent's 'The Babadook' - complete with mother terrified of motherhood and her rapidly changing son - or even something along the lines of a K-horror movie. Director Lee Cronin ramps up the tension with violin scratches and long-held pauses in action, but it's the performances that really help to sell the dread. Séana Kerslake, primarily known from lighter fare such as 'Can't Cope, Won't Cope' and 'A Date For Mad Mary', gives a grounded portrayal of a mother slowly unravelling from both the pressures of being a single mother, to her inability to grasp what is happening in her own mind. James Cosmo reliably supports the movie with an equally restrained performance, and the young child in question - James Quinn Markey - is suitably terrifying and needles out the uncertainty of what goes on behind a young child's eyes. You could sit and argue about what 'The Hole In The Ground' is a metaphor for - the pressures of motherhood, abusive relationships and the fear of passing on abusive patterns, whatever - but Lee Cronin's direction and the cinematography from Tom Comerford is able to drench the movie in enough terror and keep it going right on through the slower moments. The pacing is slow and deliberate, and while you might argue the script by Cronin and Stephen Shields is a tad predictable, it doesn't really matter when it looks and is acted this skillfully.